Container gardening isn’t really any better or worse than other gardening methods, but it is a unique way to garden. However, when it comes to container gardens, there are many things that are commonly believed that are simply not true. 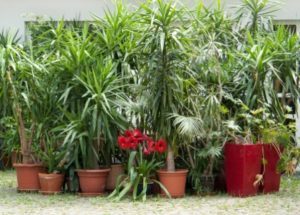 Many people feel they cannot grow large plants in containers. This simply is not true. There are many large plants that can be grown quite well in a container, including dwarf fruit trees. There are thousands of plants and vegetables that can be grown in a container without any limitations. This is a common belief because many gardeners have experienced indoor pest issues with their houseplants. The reality is that a plant is a plant and they can all suffer from disease and pest problems. Containers actually have a unique advantage over a traditional garden because a plant that develops a disease or pest problem can be moved away from the other containers. This isolates the infected plants and helps prevent the problem from spreading to the other healthy plants. Most plants will not do well if they are replanted multiple times, but moving them typically does not hurt them. In fact being able to move plants has some advantages including moving them prior to bad weather like a late frost or heavy thunderstorm. You can also adjust the amount of sun a plant receives by moving the container to a location where it receives more or less sunlight.